The St. Kitts Tourism Authority was on hand for the 12th annual Routes Americas held at the Quebec City Convention Center in Quebec City last week. The three-day event included a full program of conference sessions discussing the latest issues and challenges facing aviation in the Americas region and provided a platform for St. Kitts to meet with key airline decision makers. Also representing St. Kitts at Routes Americas was Nick Menon, Chairman of the Board of the St. Kitts Tourism Authority; Racquel Brown, CEO of the St. Kitts Tourism Authority; and Airlift Consultant Candice Kimmel, Founder and CEO of Adams Unlimited. 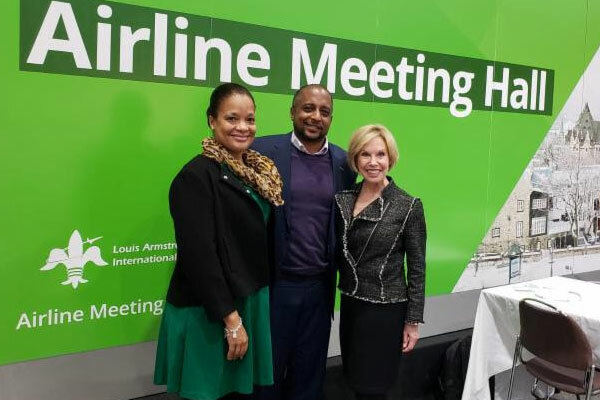 Throughout the course of the event, the St. Kitts delegation held meetings with top executives from airlines currently providing service to St. Kitts as well as those with strong potential for new route development. These executives were each presented with the business case for serving the destination from select gateway airports. Go to www.stkittstourism.kn for more. The St. Kitts Tourism Authority delegation of (left to right) and Racquel Brown, CEO of the St. Kitts Tourism Authority; Nick Menon, Chairman of the Board of the St. Kitts Tourism Authority; and Airlift Consultant Candice Kimmel, Founder and CEO of Adams Unlimited; at the 2019 Routes Americas event in Quebec City, Canada.